We haven't published baseline reviews of Low-End solutions with recommended prices below $100 for a long time already. In fact, these cheap solutions often provide sufficient performance in most games, especially in multiplatform titles. Powerful solutions initially appeared in Mid-End price range, and then time came for Low-End. Both AMD and NVIDIA have recently launched new High-End products. However, most cards that sell well apparently cost below $250. Especially during the recession. Do you know what price range is the most popular? 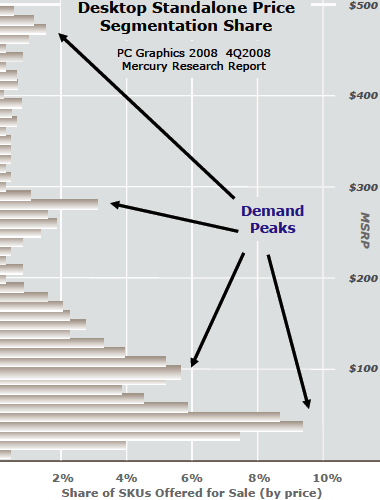 AMD published the following graph, based on research of a famous company Mecrury Research. It shows market shares of graphics cards from different segments in the last quarter of the last year. As you can see on the diagram, best selling cards cost $50, $100, and over $250. Users buy products at the costs assigned by stores, of course, but the $100 segment is one of the most popular. That's why AMD decided to roll out a new solution in this price range. This solution is notable not only for its price, but also for the latest process technology of its GPU. What's so interesting about that? Process technologies of GPUs and CPUs are constantly improving. But something interesting has taken place right now. It used to be CPUs that upgraded to thinner process technologies first, GPUs followed suite. Intel and TSMC (Taiwan Semiconductor Manufacturing Company) have absolutely different processes that cannot be compared directly, but GPUs still lagged behind CPUs in terms of mastering new fabrication processes. And finally in late April, 2009, AMD officially announces and rolls out a new solution called RADEON HD 4770, based on the RV740 GPU. That's the first GPU manufactured by the 40nm process technology. And it's the first GPU 'thinner' than CPUs. It's just an interesting fact, nothing special, but the 40nm process technology has good prospects for future GPUs. When the transition from 65nm to 45nm just began, TSMC announced the estimated rollout date of 32nm products -- 2009. And the 40nm process technology must be a bridge between 45 nm and 32 nm. However, competition with other plants made TSMC skip the 45nm process technology and proceed straight to 40nm. AMD became one of the most important partners here, of course. It mastered previous GPU process technologies earlier than NVIDIA. Although chips from AMD are the first 40nm products, they have appeared a tad later than planned. We proceed from the assumption that you are already familiar with the RV7xx architecture. Now we'll examine specifications of the new RADEON HD 4700 graphics card based on the new RV740 GPU. AMD calls RADEON HD 4770 the fastest solution among graphics cards below $100. In fact, the price tag of this solution is only nominally lower, so it's actually the fastest card for a hundred bucks. A slower and cheaper card will be launched later -- HD 4750. RADEON HD 4770 has come to replace HD 4830, based on the RV770, which is getting inexpedient to manufacture, if it sells for $100. It's the new 40nm process technology that allowed AMD to offer a robust solution with better characteristics than the old RADEON HD 4830. The new graphics card is faster and consumes much less power than the old product owing to the new 40nm process technology of its GPU and GDDR5 memory. As usual, we pay attention to memory volume and product name. HD 4770 is equipped with 512 MB of memory. Although new solutions can benefit from 1GB of video memory already, it's not expedient to install so much GDDR5 memory into a graphics card from this price range. Memory size of 512 MB is still an optimal choice for such graphics cards, which usually don't use high antialiasing levels. But the name of this graphics card is not logical in our opinion. On one hand, the first two digits indicate that Series 4700 is 'less advanced' than the 4800. But on the other hand, the last two digits in 4770 are greater than in the 4850, which has better characteristics. Inexperienced users won't know which card to choose between HD 4850 and HD 4770, judging by their names alone. But that does not happen for the first time, does it? The key theoretical information on the new architecture from AMD is published in our RV770 review. The Low-End GPU to be reviewed today differs from RV770 only quantitatively, with several peculiarities, which we'll describe here. We already know that the R7xx architecture scales well, and the RV740 proves it. We can see that RV740 differs from RV770/RV790 in the number of ALUs and TMUs. Besides, it has half as many 64-bit memory controllers. The new GPU copies the structure of RV770, to be more exact RV770LE, which is used in RADEON HD 4830. It has a part of its execution units disabled. 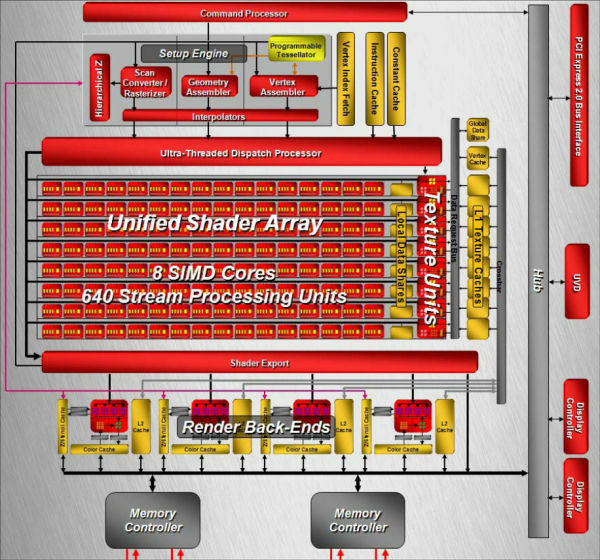 The key quantitative changes: the number of shader processors in RV740 is reduced to 640 ALUs and 32 TMUs. But this time the company did not cut down ROPs. The other architectural peculiarities of the R7xx are analyzed in the baseline review (the link is published above). Consequences of the upgrade to the new process technology and a price drop for such a powerful solution include transition from the 256-bit bus to the 128-bit one. Surface of the 40nm die is much smaller than that of the 55nm die, so it's impossible to fit a 256-bit bus on the RV740. Besides, the 128-bit bus contributes to reduction of PCB manufacturing costs. That's all clear. But how can we avoid losing video memory bandwidth, it's so important for modern applications, especially ones using full-screen antialiasing and active post processing? AMD has an answer to this question! It's GDDR5 memory. The company has been using it since mid 2008 in RADEON HD 4870. GDDR5 memory provides twice as high bandwidth than GDDR3, so the HD 4770 hasn't lost much in memory bandwidth relative to the HD 4830. For example, GDDR5 memory used in the HD 4770 provides the effective frequency of 3200 MHz, while its physical frequency is only 800 MHz. As a result, memory bandwidth of RADEON HD 4770 exceeds 51 GB/s, while it's just a tad higher in the 256-bit HD 4830 with GDDR3 memory -- about 58 GB/s. Even though GDDR5 chips are more expensive than GDDR3, especially at the initial stages, a narrow memory bus allows to simplify PCB design and get an advantage, so it's the right decision in the long run. Besides, RADEON HD 4770 uses the second generation of GDDR5 memory powered by 1.5 V. It consumes less power compared to prev-gen chips. RV740 has an important advantage over RV770LE -- its GPU clock rate. HD 4770 operates at 750 MHz, so its theoretical performance values (arithmetic and texturing speed) exceed those of the HD 4830 by 30%. That is, close to the HD 4850. But that's not all as far as advantages of the new solution over RADEON HD 4830 are concerned. Despite the cut down memory bus, RV740 still contains 16 ROPs grouped by four. Interestingly, each of such Render Back-Ends (RBE) used to be accompanied by one 64-bit memory controller. But now, even though the GPU has four RBEs, the number of memory controllers has decreased to two (you can see it on the GPU diagram). What does it give us? Theoretical peak fillrate equal to that of the HD 4870. That is, higher than in the HD 4830 and HD 4850. Considering that some of real applications are sometimes limited by the speed of ROPs, we can expect this card to be faster than the HD 4850 in several games. We'll check it up in the next parts of the article. The 40nm process technology is expedient for GPU manufacturers. It produces much smaller GPUs and promises price drops in future. Transistor density provided by the 40nm process technology is much higher than that for the 55nm process. Theoretically, a 40nm chip will be smaller by 40% than the same chip manufactured by the 55nm process technology. For example, RV740 is about 140 square millimeters, much smaller than the 55nm RV770 (260 sq. mm). Fewer execution units in this GPU also have to do with it, of course. But the new process technology has a much stronger effect. Besides, the 40nm process technology allows RV740 to operate at high frequencies. What concerns manufacturing costs, they will drop only in future, because previous streamlined process technologies are often more expedient at the initial stages. And a new process technology means relatively high percentage of rejects as well as not very low costs (AMD orders RV740 chips from TSMC). Theoretically, advantages of a thinner process technology should include lower power consumption and heat release. Transistors in a 40nm GPU are placed closer to each other, and they should theoretically consume less power. However, in practice the difference is not as big as the difference in density. For example, the maximum power consumption of RADEON HD 4770 is 80 W, while RADEON HD 4830 consumes 110 W. Not bad, but we'd like better results. However, practical peculiarities of this solution will be covered in the third part of our article.